It's time. And no , I'm not resurrecting the famous ALP political jingle . Those two simple words ignite jubiliation in the hearts of footy fans , and strike dread into those who are not . Footy's Back . Its been a glorious summer hiatus but with autumn fast approaching , and winter beckoning , AFL Football is back on the agenda. 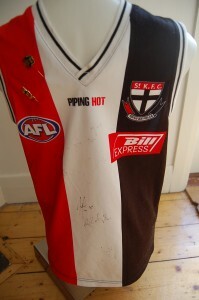 Whether your jumper of choice is the upmarket , slinky polyester newbie guernsey , or the old faithful , vintage woollen footy jumper , its time for its coming out . Packed lovingly away in drawers , tucked in the back of the closet , or arrayed in pride of place on the wall , let it out to play . The NAB Cup is done and dusted , for the many footy fans and purists who regard this as an inferior precursor to the real nail biting action of the AFL Football Fixture . Excited fans have bought their team memberships , once again swearing allegiance to their club , could this be the year for their beloved team . Changes in their teams are noted . Loyalty . love and loss is again resurrected as hopes are raised and dashed . The humble footy jumper is again in the thick of the action . revered by many , hated by few and trying to be loved by all . 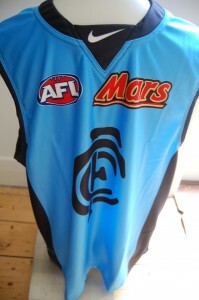 This entry was posted on Monday, March 25th, 2013 at 9:34 am	and is filed under AFL, football jumpers, NRL. You can follow any responses to this entry through the RSS 2.0 feed. Both comments and pings are currently closed.